The Phantoms Deal Out A Winner! 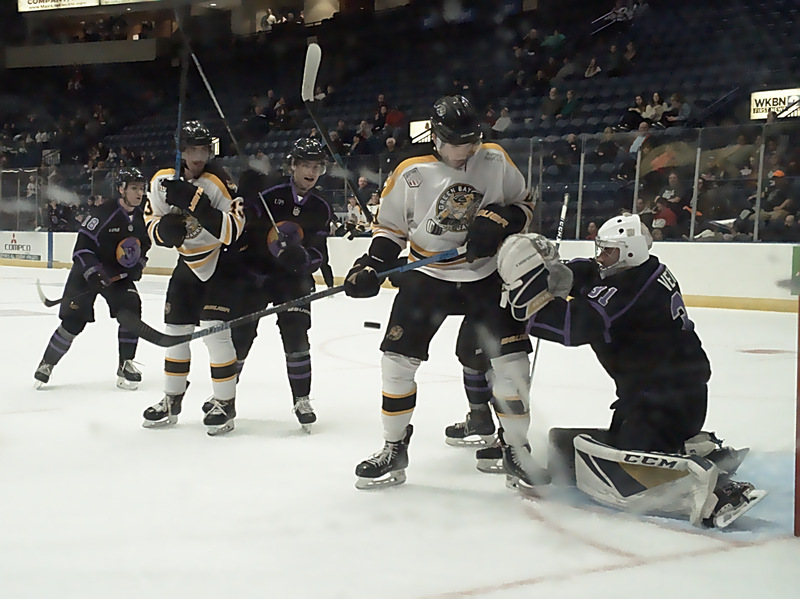 - Chad Veltri watches a puck go by as the Phantoms defense battles in a tight contest. The good news, the Phantoms won again against the Green Bay Gamblers and pulled within a game and a half of the second spot in the Eastern Conference. The bad news, they had to do it without forward Joseph Abate who was injured in Staturday's game. Abate may miss more than just this one but that'll be a discussion for the next preview. The Phantoms jumped out on top when Tyler Spott attempted a short pass to Brady Meyer just inside the Gamblers blueline. Matthew Barnaby read the play and picked off the pass and skated into the slot where he ripped a wrist shot in the face of defenseman Xan Gurney that netminder Ryan Ullan was unable to get more than a piece of and it found the back of the net for a 1-0 lead at 7:28. The Gamblers evened things up late in the first when Jesse Tucker made a nice pass from the top of the right faceoff circle to Austin Heidemann a few feet to the left of the net. Heidemann was able to make the sharp angle shot and Chad Veltri, in net for a sixth concecutive start, was unable to get across to stop it at 17:43. Shots were 11-3 in favor of the Phantoms after the first. The score would remain tied at 1 through the second, shots were 11-10 Youngstown in the middle frame. The Phantoms retook the lead just over the halfway mark of the third on a flurry of chances. A Jack Malone shot went wide of the net. Brett Murray was unable to stuff the rebound off the boards so instead he skated the puck around behind the net and attempted a wrap around. To me it looked like the puck went off the stick of Dalton Messina, who was jostling with a Gamblers defender in the crease. The goal was credited to Murray at 10:24, putting the Phantoms on top. Craig Needham topped the night off, tapping an empty net goal in off a hustle play by Barnaby. Shots were 12-8 Phantoms in the third and 34-21 total. It wasn't a bad crowd, 1,096 in attendance. This is actually a pretty good crowd for Youngstown on a Sunday, and keeps us ahead of Chicago, Central Illinois and USA for the last place in the league for attendance. We're on the road for the next two weeks. The next home game is the kids day game that kicks off a 4 game in 5 day vs the USA NTDP. Until then, a few highlights are in order. Matthew Barnaby with the steal and score! Q. Who's goal is it, Dalton Messina's or Brett Murray's? A. The Phantoms! Dalton Messina lays out Nick Leitner!